There is a heavy metal ballad called 18 and Life to Go by the 80’s Hair Band, Skid Row. The song is about a young man coming to age but gets involved on the wrong side of the tracks and goes to jail. 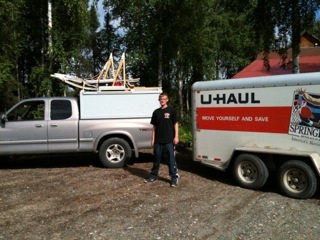 Well, my son Kyle learned a big life lesson this past week when he drove 3200 miles through Canada to our home in Alaska. As you know if you have been following this story, that I am already in Alaska. I flew up to close on the house and start to work on it before it got too cold to do anything outside. My wife, Michele and Kyle started out early on Friday the 13th with hopes of making it to the Canadian border late that night and crossing over and spending their first night of a seven day journey in Lethbridge, Alberta, Canada. They arrived at the border at about 11 pm and Michele did not have the proper documents to cross the border so they were told to come back the following morning to talk to an immigration agent (she had and undocumented issue with a revoked driver’s license from a ticket in 2000, that she took care of almost a decade ago but did not bring anything from the courts). Michele and Kyle did not want to drive back 80 miles or so to the nearest town and hotel so they decided to relax at a rest stop until daybreak. At the first crack of dawn they headed back to the Sweetgrass, Montana/Canada border and Michele was again told she could not enter without the proper documentation but Kyle could if he could prove that he had $900.00 and a letter from his mommy saying he could drive our truck. They were forced to turn around and head all the way back to Great Falls, Montana. They found the “International Airport” and Michele bought a ticket to Anchorage by the way of Seattle for 650 bucks. Michele and Kyle drove all over town looking for a Chase Bank so they could withdraw the daily limit of $500.00. They could not find one. They withdrew $250.00 in cash from an ATM and Michele gave him her debit card. So with 250 Canadian, 250 in US Dollars and an ATM receipt, Kyle dropped off Michele at the airport and Kyle headed for the border. You have to understand something. Number one, Kyle has only had his drivers license since mid-June and has never driven more than 50 miles at one time let alone a truck filled to the hilt with over 4000 pound of gear, and four dog sleds. Number two it was still a roll of the dice if he was going to get across the border with all their petty rules. Michele caught a flight on a commuter plane to Seattle (we’ll get to that story in a future post) and Kyle successfully crossed the border at about 4 pm on Saturday afternoon. It took Kyle five and a half days to make the trek through Canada sleeping very little and having the experience of a lifetime. In my opinion every boy needs to become a man when he turns eighteen. Some do it by heading to college. Kyle and I did it by driving countless miles with purpose of proving that we are ready for the world. In 1989, I drove from Portland Oregon to Richmond, Virginia by the way of Chicago after picking up a “very cute” hitch-hiker heading to the Windy City (some 900 miles out of my way) in Wyoming after losing my wallet and having to pawn my TV for gas money. Kyle saw some of the most spectacular scenery in the world: wild buffalo on the roadway, beautiful sunsets and meeting people that he will never forget (including a young man that he met again at a taco shoppe in Wasilla of all places!) He dined on beef jerky and Mountain Dew and listened to tunes, at least until some time in the Yukon when he lost his Sirius Satellite radio signal. He decided he didn’t want to sleep in hotels (to save money) and budgeted his funds more than a nerdy accountant on tax day. At some point Kyle lost cell service because Michele is with Sprint and they don’t work this far north so he called us collect and said he would be in Alaska on Wednesday morning. Relived we said to meet us in Palmer at the Fairgrounds and he could follow us the rest of the way. At 1:50 pm Michele tried to flag him down as our truck passed by. Over the next few days we heard stories from Kyle almost chronicling mile by mile of his trip. We heard things like; “That isn’t nothing, in the Yukon…” and, “I was in traffic in Calgary for hours…” and so on and so forth. But what is more important in those five and half days Kyle learned about life and responsibility and courage. Things that you don’t learn in the classroom or in school books. Kyle learned that he is 18 and has life to go. Previous The Future Home of Iditarod Dreams: Is That a Paddle in Your Pocket?